By Sue Chan - New Zealand - 21 Jun/03 - Viewed 1934 times. We drove from our Hotel in Wellington to the Ferry Terminal in only 15 mins so had plenty of time to book in our luggage, have lunch and return the car keys. We had driven aprox 2,700 km in 12 days on New Zealand�s North Island. The �Aratere� one of the Interisland Lines ferries arrived from Picton at 12.50. It is secured automatically using 2 vacuum pads, which are extended from the ship and attach to plates on the wharf. We watched it unload and load trains, cars and camper vans. It sailed again at 2pm. 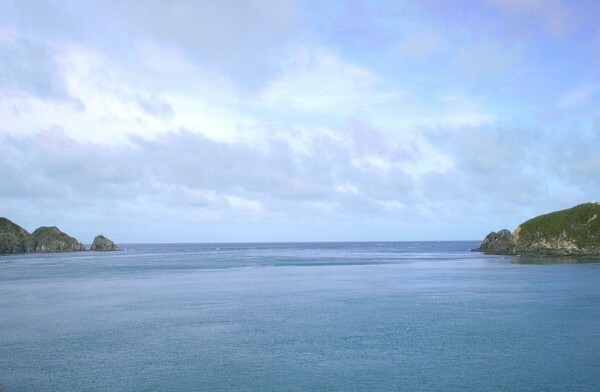 Discovered by Captain Cook in 1770 the narrowest part of Cook Strait between the two Islands is only about 19km wide. The trip from Wellington to Picton takes around three hours travelling through the Strait then the waters of the Marlborough Sound with magnificent views along the way. The ship was comfortable and stable with a caf�, shop and viewing deck. We arrived at Picton and collected our next hire car, which was upgraded to a Ford Mondao. We were pleased with this but subsequently found it not as easy to drive as the Toyota. Leaving Picton at 5.45pm along the Queen Charlotte Pass there was still enough daylight to see some of the views over Queen Charlotte Sound. It would have been nice to return that way and see more but not really practical so we had to be content with evening views. We arrived at our shelling friend�s home in Nelson by 8pm. Ivan and Doreen Burr have a lovely home overlooking Golden Bay and we were made very welcome. Nelson at the top of the South Island has a population of around 41,400 and is known for its sunshine and the three National Parks in the vicinity. Next day Ivan took us on a tour of the surrounding area. From above the cliffs behind their home we looked across the bay to the Boulder Bank a 14.5km long natural breakwater of large granite boulders and across to Farewell Spit. Cape Farewell is the northern-most point of the South Island. A little further on at Paddy�s Knob lookout we had views to the south. After stopping at a favourite pie shop where we bought pies for lunch, we called into the dried flower shop where there was a huge amount of flowers, gourds and novelty items including lovely glass flowers. We continued on to Rabbit Island to have our lunch. Doreen had packed a picnic, which we supplemented with the pies and then we walked along the beach looking for shells. Doreen is an avid collector � Ivan said she is always at least five hours once she starts � but today we limited her to about half an hour. We found a few examples of the shells usually found on this beach where she collects regularly and that night she kindly named them for me and supplemented them with some she had collected previously. We looked around the foyer at Wearable Arts, a display of outfits made from unlikely materials ranging from tin cans to plastic bags. To see the exhibition would take several hours so after taking a picture of Ivan near the front door we decided to return home for a cuppa and a rest before going into town. On the way we stopped at the Bead Gallery �a famous collection of the world�s most exotic beads�. There certainly were a lot of beads and customers can design and create their own original piece. We were finding it quite warm that day and took the opportunity while we were back home to change into lighter clothes. Ivan then drove us around the wharf area where a large amount of timber was awaiting shipment to Japan. The channel between the Boulder Bank and the shoreline has to be regularly dredged to allow the ships access. In the town we stopped at the Botanic Gardens. From the nearby street we could see the hill which has been calculated to be the geographical centre of New Zealand. So now we had seen the north and centre and hopefully we would get to the south. The drive through the Maitai River Valley to the Maitai Dam, Nelson�s main water supply, was very scenic. There is a 400m steep climb to the top of the Dam. Back in town we stopped to look at Christ Church Cathedral on Trafalgar Square, which was built over a 40-year period from 1925. The distinctive organ case houses 2,500 pipes and the organist was playing which was a real bonus. We arrived back home at 6pm after a very enjoyable day. Ivan is a �train buff� and his trains cover the entire lounge/dining room floor. Who cares when the other room where you can have meals has views like that! After tea he showed Ron what the trains could do while I looked at some of Doreen�s shells. Before retirement one of Ivan�s businesses was as a tour guide so he knows how to talk and was a mine of information about the best things to see on the South Island, (which we tried to remember). As we continued our trip we would say, �Ivan said to do that�. Next morning Doreen stocked us up with plenty of food for the day, freshly picked tomatoes and biscuits. It was like setting out from home. We were sorry we did not have more time to explore the beaches and small towns around Golden Bay or see more of Nelson but as always we had to move on.